4 Robotic Welding Myths – Busted! Have you thought about looking for robotic welding services, but you’re just not sure if this technology is a good fit for your particular part or job? Yes, there are myths, but we’re here to prove them busted and reveal some of the benefits that robotic welding can deliver. At Spec Fab, we’ve got the team, the tools and the processes to deliver perfect welded parts every single time, and our state-of-the-art welding robots are no different. They’re the perfect solution for a variety of projects – from simple to complex, and from low to high volume. Read on for a few myths, and prepare yourself for reality! Myth 1: Robotic welding is not a good fit for low volume projects. This is one of the biggest myths, and it’s just not true! Whether you’re looking for one hundred parts or ten thousand parts, the key is repeatability. One-off’s probably don’t make sense, but if you need a hundred parts every month, robotic welding could work.Remember, the robot only needs to be programmed once, and reusable jigs only need to be created once. So low-volume runs aren’t an issue as long as the same part is going to run a few more times. For example, a job as small as a hundred parts could be perfect for our robots if it runs every month. Myth 2: Programming is too intensive and will blow the budget fast. In short, this myth couldn’t be farther from the truth. Our robotic welding technology is so advanced that we can program our robots during the part design process, right in our desktop CAD software. This means parts can get on our robots fast, and can be completed quickly and precisely – without dedicating unnecessary time to robot programming or running test parts.When combined with the increased speed of robotic welding, jobs can go from design to production to completion incredibly quickly. Studies show that robotic welding can be up to 4.5 times as fast as manual welding, and that makes for a more efficient process that will save your business money. Myth 3: Setting up jigs and fixtures is way too complicated for most projects. Not anymore! Using modular fixtures is the best way to bust this one. At Spec Fab, our Quick-Set modular fixture system includes a variety of brackets, supports and other components that can be assembled quickly and precisely.And thanks to a simple dimensional mounting grid, we can create even complex fixtures on the fly. Once assembled for the first run of parts, these fixtures can be recreated quickly, easily and precisely again and again—every time your parts hit the robot. Myth 4: Expect more rework when it comes to using robotic welding services. Our welders have years of knowledge and experience, but even experts are prone to human error. Robots, however, perform at the top of their game day in and day out, 24/7. That means less rework, and perfect welded joints each and every time.Rework is almost unheard of when using robotic welding technology. Once the jig is in place and the robot is programmed, it will repeat each part EXACTLY, every single time, producing perfect welds. 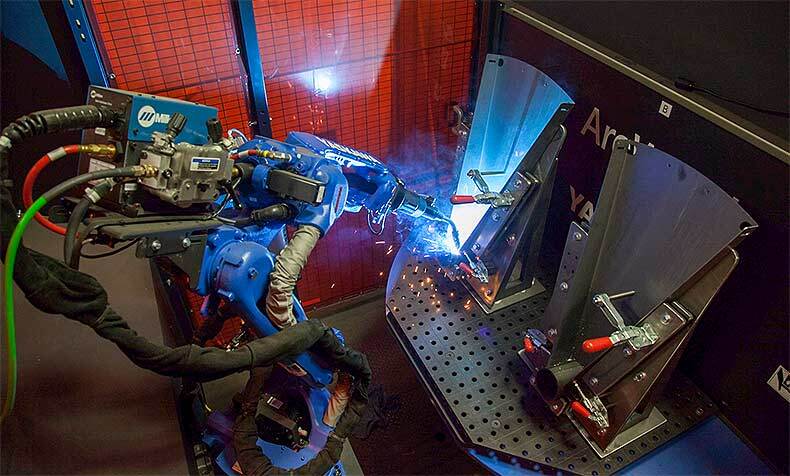 Now that the truth is out – what do you think about robotic welding? Aside from busting these myths, automated welding offers some significant benefits. Contact us today to request a quote on robotic welding for your next project, and learn more about our robotic welding services. We’re here to help!